ENJOY NIGHTLY DISNEYLAND FIREWORKS FROM THIS GORGEOUS VIEW! 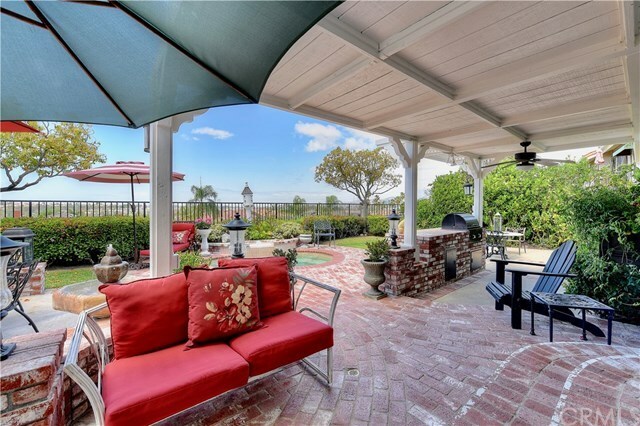 Guard gated Canyon Crest home with forever panoramic views on a single loaded cul-de-sac. Throughout the home you will find maple hardwood flooring, plantation shutters, wainscoting, crown molding, recessed lighting and ceiling fans. Formal living room features fireplace with custom wood mantle open to large dining room with French doors and city views. Kitchen boasts stainless steel appliances, custom wood pot rack above the center island, French doors off the casual dining area that look out onto backyard views. Built-in wet bar located just off the kitchen and family room. Downstairs full bathroom and bedroom with closet can be used as a bedroom or office. Second floor features master suite with stone fireplace and French doors that open to an expansive balcony with forever panoramic views. Master bath features separate shower and soaking tub, new fixtures and two walk-in closets. Two secondary bedrooms share hall bathroom with dual sinks. Third bedroom with built-ins, closet and full bath large enough to be used as a bonus room. Well-manicured backyard is accentuated with covered patio with ceiling fan and built-in barbeque which extends to the spa and three sitting areas all with views. Central vacuum and downstairs laundry room with custom large storage closet. Located down the street from Canyon Crest clubhouse offering two pools, jacuzzi, tennis courts, gym and playground. Directions: From Melinda, travel up Heather Glen and turn left on Canyon Crest.